Egypt is approaching a critical moment. Since last fall, the popularity of President Abdel Fatah al-Sissi has steadily diminished not only among the public and many of Egypt’s secular and Islamist intellectuals but also among key supporters of his regime. He’s still going to win the sham presidential election scheduled for March 26 to 28. But there are many signs that his second term might not last for as long as he hopes. Sissi has unleashed a crackdown on dissent that has no parallel in the country’s modern history. Yet this campaign is falling short of its intended objectives. Now discontent is brewing among the ruling elite, including the military. This is a much more serious threat to the president than Islamist and secular opposition. After Sissi failed in his bid to amend the constitution, which would have extended the presidential term from four to six years and enabled him to avoid holding elections this year, he embarked on an effort to ensure victory by preventing his fiercest opponents from running. The government ensured that Ahmed Shafiq, a former prime minister and air force commander who had declared his plan to campaign among members of the Egyptian diaspora, was deported from the United Arab Emirates to Cairo, where he was confined in a remote hotel until he withdrew his candidacy. Shortly afterward, former armed forces chief of staff Sami Anan announced his intention to run for the presidency; he was kidnapped from his car by soldiers a few days later. When his deputy Hisham Geneina, Egypt’s former top state auditor, set off to file an official appeal to restore Anan’s candidacy, he was brutally assaulted by police-affiliated thugs. Meanwhile, an army colonel was sentenced to six years in prison after announcing another presidential bid. Two of Egypt’s most powerful security officials have been fired and detained: Khaled Fawzy, director of the powerful Eyptian General Intelligence Directorate (EGID), and Mahmoud Hegazy, the armed forces chief of staff (the latter under house arrest). A genuine struggle for power is underway. Anan was pushing a plan that would loosen the military’s grip on power. This vision, developed through consultations with secular politicians and several former and current senior military officers, offered an alternative to the current political system, in which power is distributed among top-ranking members of the armed forces. The discontent in the army has three sources. The first is Sissi’s decision, over a year ago, to transfer the sovereignty of two Egyptian islands to Saudi Arabia. The second involves foreign media reports suggesting that Sissi might be preparing to give up parts of Sinai as part of an Israeli-Palestinian settlement. The third is the government’s notable failure to respond effectively to terrorism, especially since both Shafiq and Anan used the word “treason” when commenting on security failures. The extent of the discontent has been dramatized by a series of leaks that reflect badly on Sissi and the military intelligence agency, his No. 1 backer. Such leaks never occurred under Hosni Mubarak. The arrest of Anan was followed by the arrest of 23 military officers who support him. The arrests stirred up anger inside the army to a point where the senior command had to issue an internal memo banning political discussion in military facilities, even though such discussions are already illegal. Since Sissi came to power, hundreds of EGID officers have been dismissed or transferred. The newly vacant position of director of the EGID wasn’t filled by an insider but by the presidential chief of staff, Abbas Kamel. Kamel’s first act was to fire dozens more senior officers based on a list prepared by Mahmoud al-Sissi, the president’s son, who supervises the internal security of the EGID. (Egypt’s partners in Washington have taken note of Mahmoud al-Sissi’s prominent role.) Meanwhile, another son of the president’s, Moustafa, who is an army officer, has effectively become the most influential person in the agency that approves the appointment of senior government officials, including ministers. 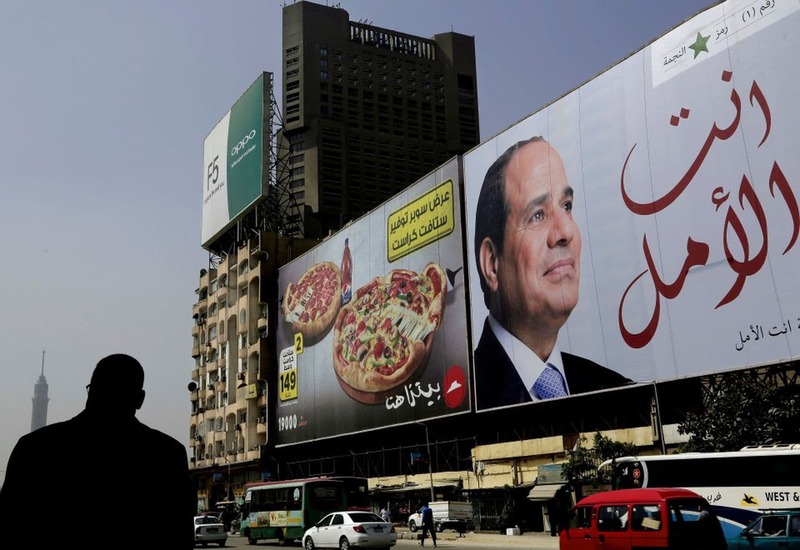 At the start of his first term in 2014, Sissi enjoyed a 90 percent approval rating and unwavering support from liberals, the business community, the state bureaucracy and the army. Four years later, the president’s inner circle has been reduced to a handful of advisers and family members. This dramatic erosion of support does not fit the narrative of a regime in seamless control. Rather than campaigning for reelection, the incumbent president has been increasingly visible in the past weeks at military and police ceremonies, where he has been wearing his military uniform and appealing to those who he thinks can offer the support he needs, even though serving members of the security forces don’t have the right to vote. If the elections go according to plan, Sissi’s second term is likely to be turbulent. But there are broader questions that are worth urgent consideration: What will be the ultimate cost of his attempts to secure his personal rule, and what will be the repercussions for stability in Egypt and the region?